Dissolvable Tobacco Products Draw FDA Scrutiny : Shots - Health News Supporters of the product say they help quit smoking. Opponents maintain it's a gateway to cigarettes. Both groups are making their case to the Food and Drug Administration, which is studying the flavored melt-in-your-mouth products. 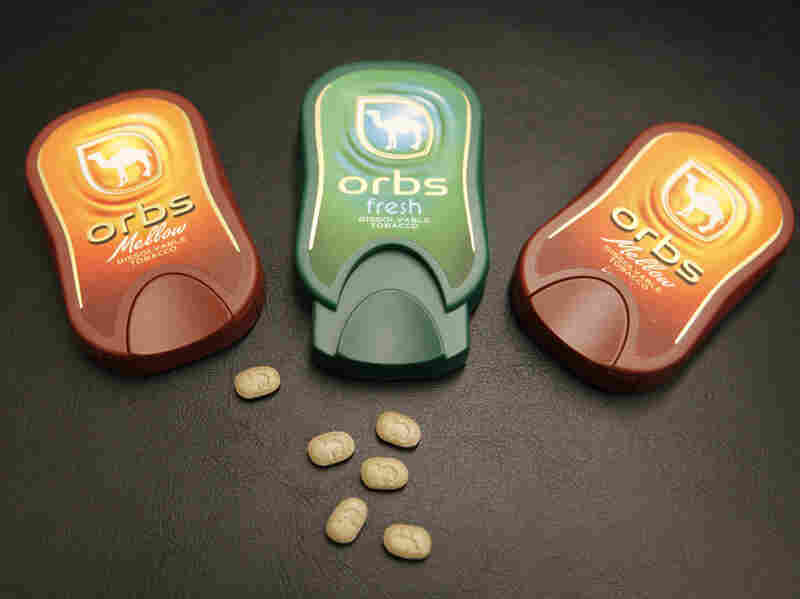 R.J. Reynolds' Orbs, a dissolvable tobacco product. The Food and Drug administration is studying the flavored products. The Food and Drug Administration has a gathered a group of scientists and other experts to study flavored melt-in-your-mouth tobacco products. The panel, meeting this week, will hear from two camps of stop-smoking advocates: those who worry that dissolvables are a gateway to smoking and others who say they help people kick the habit. Gregory Conley, a 24-year-old law student at Rutgers University, pops a dissolvable during class or while he's studying. "You just put it in your mouth and hold it as if you were holding a piece of straw between your teeth," he says. They deliver a slight nicotine tingle that Conley says helps curb cravings. "I was never really going to stop," he says. "I had tried with the traditional methods, and found them completely unhelpful: the patch and the gum and the lozenge." Conley finally gave up smoking, using electronic cigarettes; he says dissolvables keep him on track. The government regulates dissolvables like other smokeless products such as chew and snuff and the warning labels are similar. Companies can't market dissolvables as a stop-smoking aid. Some health officials and a group of U.S. senators have called them "nicotine candy" and want the FDA to tighten the rules. Conley says he hopes they won't. "The public health people are saying, 'Oh, we need to wait, we need to still get more data,'" he says. "Every day and every year that they wait to tell the truth about the relative risks of different tobacco products, more people are dying." Conley is so convinced, he volunteers with the Consumer Advocates for Smoke-Free Alternatives Association and testified during the FDA's meetings this week. [The FDA] is under enormous political pressure from both sides. Kenneth Warner, a health economist at the University of Michigan, says the FDA is hearing from both sides of a long-running debate. "The one extreme are the folks who believe that no product containing nicotine or tobacco should be permitted on the market unless it has undergone review," Warner says. "The other extreme is to say that any product that superficially appears to be significantly less risky than cigarette smoking should be permitted on the market to allow consumers to have a less hazardous option." Warner says it's the FDA's job to consider the health consequences for the entire population, not just individual smokers. He hasn't seen solid evidence supporting the benefits or harms from dissolvables, but he says the panel has to look at all the science. "It is under enormous political pressure from both sides," he says. Some health officials worry young people will try dissolvables, develop a taste for nicotine, then graduate to smoking. They also wonder if dissolvables keep people hooked. Bill Godshall, who leads the group SmokeFree Pennsylvania, is afraid the questions before the tobacco advisory committee will inevitably lead to a ban on dissolvables. "You know, asking, 'Might children choke or die if they swallow, accidentally, some of these?' Well, yeah, that's always a possibility, but the FDA doesn't ban every medicine in your medicine chest," he says. The doctors and coaches who help people quit say they welcome anything that will help their patients break free of cigarettes. Some are quietly recommending dissolvables as a first step. Others say they'll wait for an FDA ruling. This story by Taunya English is part of a reporting partnership that includes WHYY, NPR and Kaiser Health News.